Location: East 14th St.& Waterloo Rd. All brick forms turned in between Sept 16 - May 15 of each year will be cut and in the ground by June 30. All brick forms turned in between May 16 - Sept 15 of each year will be cut and in the ground by October 31. The shelter, with picnic tables, accommodates 48 people. There are no restrooms in the park, however the Cedar Falls Recreation Center is located nearby, at 110 E. 13th Street. For rental information and to make a reservation, call the Rec Center at (319) 273-8636. 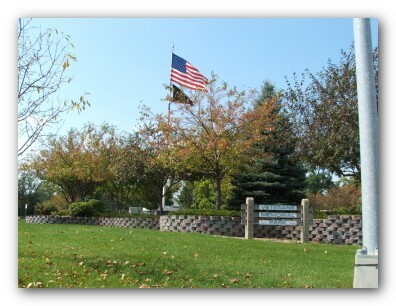 Acquired in 1996, this park is dedicated to those who have served their country. The park pays tribute to all 5 military services and recognizes individuals by engraving their names on the five brick walkways established in this passive park. It is an area created for quiet reflection and/or public ceremony. Tucked behind the Cedar Falls Recreation Center at the corner of Waterloo Road and 14th Street is a little park with a special purpose—to honor the service of veterans. Veterans Memorial Park Phase I was dedicated in 1997 as a fitting memorial honoring our country, paying tribute to the five military services, and recognizing the individual service and sacrifices of veterans. At the main entrance to the park is a miniature Statue of Liberty gifted to the city by the Boy Scouts of America in 1952. The focus of the park is a 50 foot flag pole placed in a circular plaza paved with stained concrete and engraved bricks. The pedestal for the flag pole is comprised of five jet black granite tablets mounted in a pentagon shape foundation of exposed aggregate. A tablet for each service branch is etched with its seal. Walkways of bricks bearing veteran’s name, branch of service and service dates radiate from the base of the granite pedestal. (These bricks may be purchased by veterans, relatives, or friends wishing to honor veterans. Please use the attached form to place an order.) The design of the park is both a community and individual expression of thanks and honor to all veterans. Throughout the park are evergreens, flowering trees and other plantings which, along with five granite benches surrounding the plaza, provide an environment for visitors to rest, reflect, or meditate while at the memorial. Veterans Memorial Park is a special place to preserve the memories of veterans who answered our nation’s call and ever reminds us that freedom is not free. The Black Hawk County Freedom Rock is part of an Iowa Freedom Rock Tour. 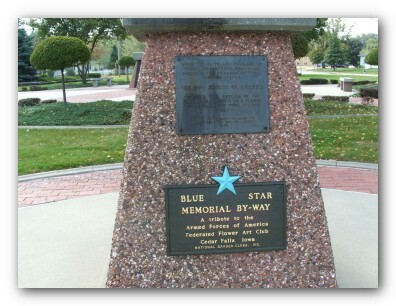 The idea originated with Ray “Bubba” Sorensen II, a native of Greenfield, Iowa, the site of his original Freedom Rock. He launched the tour in 2013 engaging local support to locate a rock for painting in each of Iowa’s 99 counties. Donated by a local developer, the rock was transported across town to its location west of Veterans Park Phase I. The eight foot high granite boulder, estimated to be 14 tons, was installed in the park on September 11, 2015. The front side features an American flag draped from the top below which stands a small boy with his hand over his heart, a marine in dress blues saluting, and an aged Legion member saluting; an intergenerational demonstration of patriotism. The south side is a likeness of U.S. Petty Officer Second Class Taylor Morris, an explosive ordinance disposal expert (EOD) and Cedar Falls native, who lost parts of all four limbs in an explosion May 2012 in eastern Afghanistan, and who survived quad-amputations. The need for additional space and a facility for veterans’ families and the community to gather resulted in the development of Phase II. Fundraising, donated time, materials and equipment, countless volunteer hours, and the support of the community resulted in the park and shelter being dedicated in June 2016. It is located directly south of Phase I. Phase II has been recognized with a Cedar Falls Business & Industry Award and was made possible by efforts of Sid Morris and Mike Butler.